A video recently has made the rounds, showing dog trainer celebrity Cesar Millan working with a food guarding Labrador named Holly. We do not know much about Holly’s history, but the it is understood at the beginning of the video, that she has major food aggression issues. In this short film by National Geographic we see him moving into the dog’s space as she is eating out of her food bowl. As he is pushing her away, he explains her body language and just as he reaches to pet her, she turns and bites his hand. Why Millan was not able to read the dog’s clear body language and endanger him as well as Holly, is one issue and not one we will discuss here. I would like to focus on a resource guarding dog’s behavior and what might be a better solution to tackle the problem. First we need to understand resource guarding, how it looks like and when it can happen. There are many ways and levels resource guarding shows in a dog. It can be directed towards people, dogs or other animals or even things in the environment including changes in their immediate surroundings. Some dogs guard food, some ‘protect’ toys, other dogs or pack members including people, even places like their crates, beds or couches. A dog might guard a specific toy but be completely fine with other toys or show guarding behavior only towards certain people. It is important that we understand the variety of resource guarding. It is equally important to understand, that not always does it mean you will encounter a teeth baring, snarling Cujo cowering over his bone. More often than not, it is a subtle protective move with the head over the item, stiffening the body and carefully eyeing the intruder. Many dogs won’t go beyond that, but make no mistake – this is just as much a guarding behavior as baring teeth, ready to attack. It is a natural behavior, but it can’t be accepted in our society. 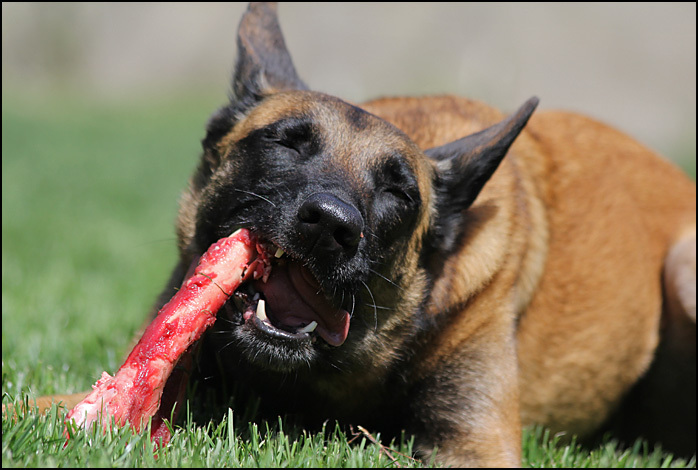 There are a myriad of reasons why a dog starts to display signs of resource guarding. Some breeds are more prone to it than others, some dogs have had to fight for their resources growing up, some do not (yet) trust their owners and some just take advantage of their owners’ weaknesses. The last one is popular with people who attribute many dog behaviors to dominance and they will tell you, not to allow your dog to show this behavior and to take charge. Some will make you roll your dog on its back or have you go into some sort of kung fu stance over the item of the dispute and staring down the dog, much like Millan does it in the video. The outcome is rarely a good one. At the very least, you will destroy whatever trust is between you and your dog – and in the worst case, you have created a liability, a dog who has lost any bite inhibition and will start latching onto anything that comes close to it. While it may help with working on the issue, we may not always have the luxury of knowing our dog’s history and thus the reason for its reaction. So what to do? First and foremost, do not wait until the situation escalates. If you see your dog cowering over a toy, getting stiff when you approach while your dog’s eating or hear your dog growling lowly when you get near its favorite sleeping location, it’s time to work on it. If your dog is displaying the above mentioned signs, it is not the right time to take away the item or chase your dog off the couch. It doesn’t mean that you have to let it slide, just re-schedule the training to a time when your dog isn’t about to chomp down on you. Believe it or not, but this isn’t a situation that your dog enjoys. Most likely your dog displays signs of stress between the growling and being stiff. Licking its nose, trying to look away, pretending to sniff the air or even backing off a bit all means, that really, neither one of you want to be in this situation. If your dog guards the couch, try to get it down by offering a yummy treat (often just going into the kitchen and opening the fridge door may be enough). If that doesn’t work, calmly put a leash on your dog and lead him off. It is important, that you keep calm and are not afraid. Once your dog is off the couch, don’t let it get up again. The same works with a food or toy item as well. If you don’t want to get too close to your dog, calmly throw the treats as you walk closer. Don’t walk straight up to your dog, turn your body side ways and do not stare at your dog. It is important that the treats are better than whatever your dog has in its possession. Hot dogs or cheese work usually very well. Don’t corner your dog. Make sure, he can walk away. The most important thing you will need, to work on this issue with your dog, is trust. If your dog fears you or thinks, that you will take away its toy every time you get close, you won’t have much success. So instead of always reaching for the toy when your dog is close to you, just pet your dog and let it have it for a while, even when you play fetch. Work on the threshold, how close you can get while your dog is eating without stressing your dog or making it feel uncomfortable. It may take a couple of days to weeks, depending on the level of the guarding. If you have to, feed your dog from your hand instead of letting it eat from a bowl, at least for a while. When your dog is eating from a bowl, walk by or get closer and either throw a piece of hot dog or, if you can get that close, feed that treat from your hand, so your dog gets used to you being around its food or toy and knows, something good is going to happen. 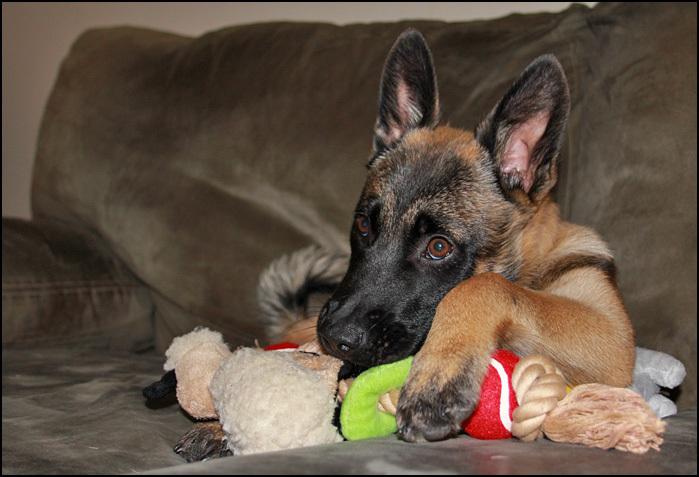 Swap a good toy with a better one or a treat when your dog is playing.Make sure, the situation is calm and relaxed. Take your time. This builds trust and lets you work on the distance, where you can get close to your dog without your dog feeling the need to guard its possession. Your dog needs a safe place – for some dogs it is the crate, some have a blanket or a dog bed, but dedicate a place, where no one bothers your dog. Let this be your dog’s haven where he can go, when he is stressed. Do not let visitors or children bother your dog when he is resting there. Don’t mistake the above training tips for showing weakness. You can’t fight fire with fire in this case. Yelling and poking at your dog in this stressful situation will make everything worse. This is about defusing, de-escalating and creating a more stable relationship where you can build on. Additionally to the above direct measurements about resource guarding, you will need to establish boundaries. This is where your leadership comes in. Work on your dog’s general obedience, be strong, consistent and fair. If you are uncertain or if your dog’s behavior already includes biting, consult with a trainer, who has experience with dogs like that. Be suspicious, if the first thing a trainer does, is slapping a training collar on your dog. 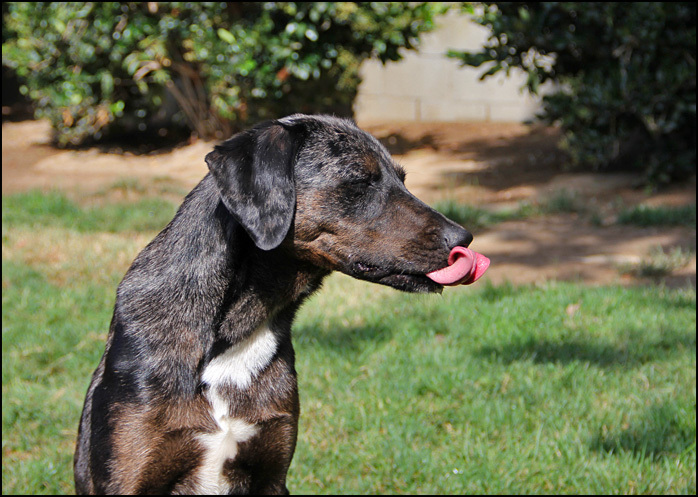 Establish realistic goals – if your dog has shown resource guarding behavior for the last seven years, don’t expect it to change within three days. Document any behaviors in order to see the progress. Resource guarding is an issue of trust, boundaries and patience. It is not about showing who’s stronger or more powerful. ← Heat Wave – Protect Your Dog! Hi Kim, thank you for your comment. It is not easy (and sometimes downright dangerous) to give advice about any type of aggression without actually having seen the situation. The behavior of your 5 months old Border Collie could be just playful and harmless or it could be the start of a serious problem. The behavior described is not unusual for the breed. I would try and see, if I could resolve the issue positively, without corrections as this might make it worse, especially in that young age. Distributing low-level treats (treats, which are not of a really high value, e.g. dry cookies instead of yummy hot dogs) among all the dogs and praising your pup when she behaves, might be a start. I would not let your other dogs be responsible for scolding the pup, necessarily – this is your job. All in all though, I would consult a trainer in your area, who has experience with Border Collies. Group obedience classes are always awesome as well – not necessarily for the obedience, but for the distraction with the other dogs.Good luck! I can also vouch for your idea on “working on a threshold” with the food aggression. It sounds similar to desensitizing/counter-conditioning as I’ve read about in an ASPCA article. It took about 3-4 weeks, but now I am able to comfortably feed my dog with my hand while holding the bowl. I have also tried to approach him while he is eating but offering high value treats. Still a work in progress but will continue working on it until he shows no more signs. I see the relation to resource guarding. My dog only acts like that with his Kong right before my husband and I leave for work as a treat we give to him in the morning. It has gotten worse when we introduced back his crate…today he flat out growled at me after I gave him the Kong as I was closing the crate. I feel like we have a lot to work on because we don’t want the aggression to get worse, and most importantly, I want my dog to trust me while I maintain a “higher rank” in the pack. I think he’s fighting for that position! Any other advice would be appreciated but I absolutely agree with building trust first and not trying to escalate the situation. Thanks! Hi Elaine, Thank you for your comment. The crate might make it a bit worse, because, once your dog is in the crate, there is nowhere for him to go when you get closer. He is ‘backed into a corner’ and his growling is warning you to stay away. I do not think, it has anything to do with him wanting to move up the ranks. He has something of value and does not trust you to not take it away from him. It sounds like you made progress building trust, so I would continue what you are doing, but keep the crate training and the trust building process separate. Do you fill the Kong with food? Does he also growl when he has the empty Kong? Just with the bowl, you could introduce the idea of you getting closer to the crate with throwing pieces of food (small, low level food pieces) and not have the Kong anywhere near. Once he is comfortable with you being close, I would add a command for him to go into the crate and one for him to come out. Always, always reward him with a high value treat, like a piece of hot dog, which you feed him off your hand. After a while, this should become so ingrained in him, that he will feel great when you give him the command to come out and he’ll expect the piece of hot dog in your hands. When you see that behavior, you may introduce the Kong again. Start far away from the crate and give him the command to come out. Use a very motivational tone, not a ‘command voice’. Reward him greatly when he comes and don’t rush back to the crate to retrieve his Kong. In fact, leave the Kong there and allow him to go back to it. Repeat and repeat. After a while, when he’s coming out to you and after you rewarded him, have him go to another room or outside and then go and get his Kong. Do that process for a while. This should take away some of the stress that both of you have in this situation right now. After a while get closer to the crate and proceed just like you did with the food bowl. Another, maybe easier way, would be to take the Kong, when he is outside of the crate, fill it with some goodies, then take it again once it’s empty and fill it again, so he starts to understand that if you have it, you will give it back to him filled with great stuff – or have a second one, already filled and swap it with him. This only works though, if he’s ok with you taking it away outside of the crate. I hope, this makes sense. Please keep us up to date with your progress! Good luck! My 14 month-old great pyr demonstrates these behaviors but ONLY when she STEALS something tasty or chewy. She is remarkably tolerant otherwise. If I hand her a fresh soup bone with peanut butter all over it I can walk away, walk back and take it away. If she steals something less savory (e.g. a clean sock) she will generally will leave that on command. But if she grabs a used tupperware container from the counter behind our backs and runs away with it, she will hunker down, guard, growl and snap if you reach in. She will even give chase to whomever picks up the stolen object. I get it back with a trade of something “better”. She is the same with other dogs, fine 99% of the time, but if she STEALS something “good” she will run, crouch and protect it aggressively. Family and friends are under strict direction to never try to take back. It’s not getting worse, but I don’t think it’s gone away either. We have a good trainer who gives all the same advice as in this article. Is there anything else I should try to take that edge off? Hi there…we just rescued a labx yesterday with some resource guarding issues. I have run with her and also walked her yesterday, I have hand fed her and she will give up a ball outside no problem. But if my other dog has a toy, she will try and take it from her…we had a scuffle yesterday! So all of the toys are off limits until she trusts more and the dogs can figure things out. Any other advice for us? Our other dog is a 10 yrold black lab who doesn’t have a vicious bone in her body. You can see she is very confused by this behaviour. Otherwise the new addition is great….